Before I issue this week's entry, I'd like to thank those who've posted their positive feedback to the ever-developing format of these TSPDT entries - first with the text and image compilations of writings found on the internet for each film, then the embedded video clips, and most recently the video essays.Recently I received some feedback from a couple of my friends at IMDb who've read my reviews for years, and they've found these new extended blog entries to be overwhelming to absorb, partly because of their length and partly because at times it's hard to tell what is my own writing or opinion on the film. For those reasons they feel disinclined to respond or take up a conversation. Not sure if this is the impression others have had, but I'm going to try to address this by resuming the format that I used for my reviews for years, the capsule summary, modeled after the great Chicago Reader Brief Movie Reviews. Hopefully that will give readers a succinct and evocative sense of what I think about the movie, and as a result will elicit more of a response. But I'll also keep the video essays and the annotated bibliographies because I do think those have value. Perhaps this three-tiered project seems ambitious, but worthwhile. I'm thinking of conducting a brief feedback survey to see how this project has come off so far. 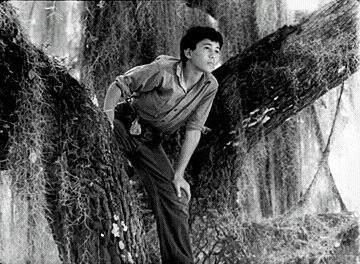 TSPDT rank #880 IMDb The last feature made by cinema pioneer Robert Flaherty depicts life in the Louisiana bayou, as seen by a mischievous Cajun boy, just as an oil drilling company arrives to scout the swampland. The film was commissioned by the Standard Oil Company to showcase the oil industry's contribution to modern civilization; such circumstances would make the film seem dubious in light of today's increasing concern for the environment and cynicism towards corporate spin. But the film was heralded at the time, both in its story and its technique, as a triumph of modernist cinema in depicting the reconciliation between man, nature and technology (it was even voted one of the ten greatest films of all time in the first ever Sight and Sound Critics' Poll). Indeed, the film showcases the Flaherty aesthetic at its finest. Flaherty is often considered a documentary filmmaker, but he's clearly after more than just filming reality; he's looking for the moment that's realer than reality, where time seems to stand still and the world and the camera lens combine to reveal beauty, in the swampand, in human faces, even in the rhythmically mechanical routine of the oil drillers. That the film succumbs to narrative demands by the end, with a gratuitous alligator hunt sequence followed by a hokum plot twist, underscores the difficulty of sustaining such a high level of cinema, but the film's first half does plenty to justify his art. Indeed, by the end of the film, one wonders if the implicit conflict raging in this film is not just between man, nature and technology, but between Flaherty's non-narrative visionary impulses and the prosaic narrative demands of the public. Want to go deeper? The following is an annotated bibliography of key quotes I've pulled from online sources and the Louisiana Story DVD by Home Vision Entertainment. "What they wanted was "a classic. A permanent artistic record of the contributions of which the oil industry had made to civilization. A film that represents the story of oil with the dignity and the epic sweep it deserves, and assure the story of a lasting place on the highest plane in the literature of the screen. The film will also be such an absorbing human story that it would stand on its own feet as entertainment anywhere. Because of its entertainment value, it would be distributed theatrically through the regular motion picture houses, both in America and abroad." - Frances Flaherty reading the commission letter by the Standard Oil Co. for Robert Flaherty to make the film that would become Louisiana Story. "I think [Robert] felt that these people, primitive as they were, had a great deal to teach us. Nanook's problem, [Robert] said, was how to live with nature; our problem is how to live with our machines... we have made for ourselves a situation that is difficult for our spirit to come to terms with: our machines. "No one," said John Grierson, 'ever handled a camera more lovingly. His attitude towards it was that of a mystic.' The camera was a machine for seeing more than the eye could see. He didn't presume to write scripts. He didn't presume to tell the camera what to see. He didn't say to the camera, 'This is life.' He asked the camera, what is this mystery that you can see better than I can see? "I remember my own personal reaction to Mr. Flaherty with his vast experience, that truly one should know what one is after and go and get it. But slowly - I was very young - I was realizing that the quality of groping, of searching, is precisely what makes it interesting... The moment you stop groping, you've lost something... I remember again Mr. Flaherty often saying that films are made of time and film. You can't ordain it. You're dealing with the elements, you're dealing with real things. You can't just push them around and shove them into schedules. You just have to live with them, you have to learn to live with them." 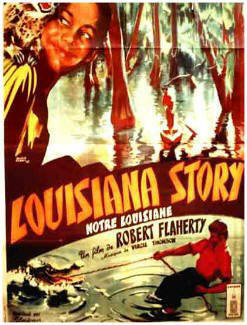 Unlike Flaherty's earlier films, Louisiana Story marks a reconciliation of industrial modernity, initially dealt with in The Land, with an edenic regionalism apparent in the likes of Nanook and Moana. In this reconciliation it is possible to understand [Siegfried] Kracauer's enthusiasm for the film whereby the alienation from the modern world is directly addressed through its filmic representation. The response to modernity imposing itself on the environmental and psychic realms of post-war capitalism is countered through Flaherty's insistence on a naive vision that promotes a sense of wonder at not only the natural world but at how that natural world can be understood in the face of the industrialisation of this eden. 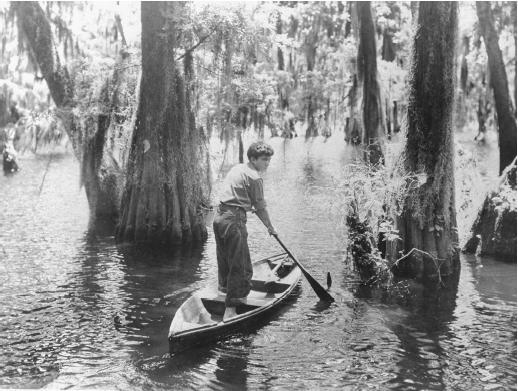 For Flaherty and Kracauer, the poetic rendering of the world makes it possible to re-engage the spectator who feels that they have been alienated from things such as the "the ripple of leaves stirred by the windâ€, or, in the case of Louisiana Story, the ripples on the water stirred by the passing of a canoe.